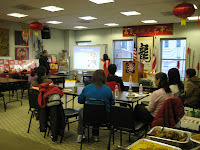 On January 27, 2009, DC Family Strengthening Program (FSP) invited participating and prospective parents, as well as some of our community partners to join the event of celebrating Lunar Chinese New Year. 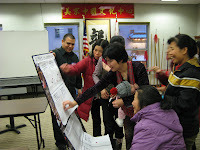 Thanks to the support of Chinatown Community Cultural Center (CCCC), at whose facility the event was held, closer to where most of the parents live. Dinner, activities, and book store gift cards for children were provided. 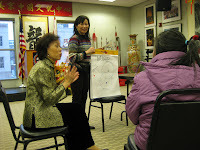 FSP began to hold monthly parent group meeting at CCBA (Chinese Consolidated Benevolent Association, 510 I St. NW, Washington DC) since February 2009. Communty Partners will be invited as guest speakers. Our upcoming parent group meeting has been scheduled for 3/17/09, from 3:30 till 5:30 p.m., and the guest speakers are from the Asian Pacific American Legal Resources Center and Housing Counseling Services, Inc. In addition to presentations by the guest speakers, FSP program manager, Sue Chen, will provide handouts and facilitate discussions on parenting issues. The topic of discussion with the parents will be "how to mangage anger effectively to avoid lashing out at your children" for the 3/17/09 meeting. Please contact Sue Chen at 202-884-0322 ext. 110 if you're interested in joining FSP's monthly parent group meetings.